The inspiration to this text came from another blogger (a prolific writer btw and so much more eloquent than me) who wrote about walking up a mountain together with her children and who described how the grandeur of nature unfolding in front of her eyes ignited essential thoughts about our existence and life’s meaning. My here described walk with the cat family in the adjacent forest was in contrast rather routine and the scenario was far less spectacular, but my brain was also busy with similar considerations and when we came home I decided to write down the ideas that were going around in my head as far as I could still remember them. We started the walk at eight PM. It was very dark, because the sky was clouded and it was nearly new moon. Fortunately darkness is not really an impediment for me because I know the forest so well, that I would find my way even blindfolded. It was eerily quiet as we walked the way to the big clearing in the center of the forest. The cats didn’t make a sound, but I knew that they were there and every now and then I saw a faint shadow rushing past me. Suddenly the wind was whispering. Normally the leaves would be echoing the wind, letting the whispering only slowly die down. But as it was winter, the leaves where all laying on the ground, and the whispering stopped as abrupt as it had started. It was exactly at the point where Cindy always joined the walk and therefore I knew, that this was Cindy’s ghost. Cindy was my little cat friend who disappeared in October, most likely killed by hunters. I commemorated her in my blog post Something Personal and I unloaded much of my grief in this blog post, but she still is always in my mind when we make our daily walks. Cindy spent most of her time (and in fact most of her life) in the forest, but she nearly always joined the walks. I only had to call her name two or three times, and she came, running with lightning speed towards me and rolling on her back right in front of me, waiting that I would kneel down beside her and softly caress her. She liked that so much and she would immediately start purring as loud as she could. The cats and I continued the walk and when we reached the big clearing I heard the wind whisper again. I kew, that Cindy’s ghost was still with me, wandering and jumping around and sniffing here and there just like her fellow cats. Cindy’s ghost often visits me in my dreams. She had the habit of coming home from the forest after midnight and scratching on my bedroom door till I went up and let her in. This was usually between two and four AM. After I had let her in, Cindy waited till I was in bed again and then she jumped onto the bed and laid down right beside me either on the blanket or on the pillow and she often pressed her little head against my cheek. Cindy and Lizzy were the only cats who made this (Lizzy, the cat love of my life, died on the 1st of June 2010 at the age of 18). They where the two cats which I saved from certain death and they both were well aware of this fact and as close to me as individuals of a different species possibly can get. I wrote about both cats excessively in preceding blog posts and don’t want to repeat myself, yet for the purpose of this text I have to point out, that Lizzy hat a troubled life with much hardship and suffering. Her first ten years were terrible, the following eight years that she spent with us after she had lost her left paw in a mowing machine were better, but also marked by severe injuries and sicknesses. Cindy was luckier, though her first year was also not easy because she had to overcome severe bacterial and parasitic infections. After that it went quite well and she lived a fulfilled and happy cat life in the forest and in our home. She was flourishing and we had a great time when she joined the cat walks or came home to sleep on my bed. It is sad that her little life so suddenly ended after only three years and three month. Cindy and Lizzy had both their individual and easily distinguishable pattern of scratching, and I knew alone from the sound and rhythm of the scratching which cat was waiting at the door. In addition to that my unconscious brain obviously paid special attention to this two patterns, because I always woke up instantly, when Cindy and Lizzy wanted to come in. Other cats had to scratch harder and longer to wake me up. 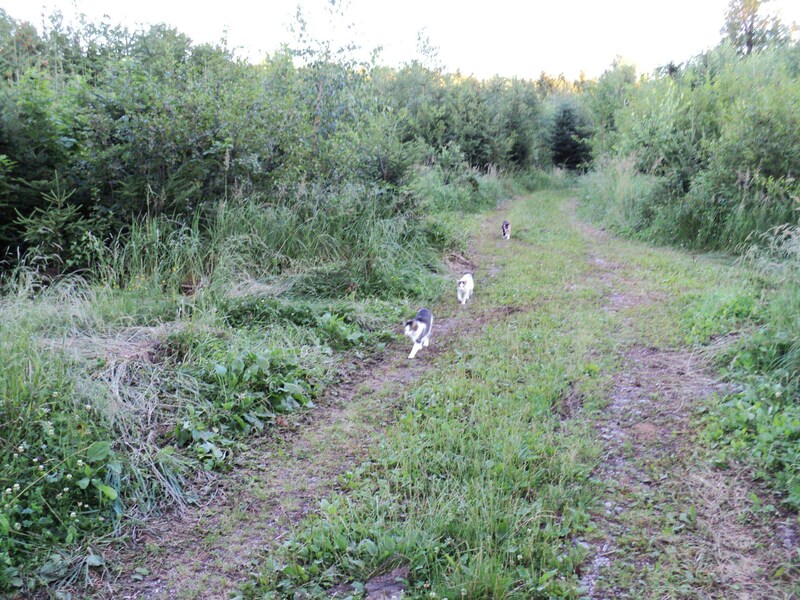 Back to my walk with the cats: We had now reached the other side of the big clearing and we would soon come to the log pile beside the way and turn left into a small path that only we and the deer knew and used. I had to stop for a moment and wait for the stragglers so that they could catch up. While I was standing there in darkness and silence I recollected the various pictures and sounds and episodic memories about my two little friends and one question arose and persisted in my mind: Was it worth it? Was the short life of the two little animals worth the pain and hardship, was it worth the exhausting struggle to survive? And was it worth my efforts, my worry, my anxiousness and distress? As the question mark grew bigger and brighter and metamorphosed into something completely indescribable with shapes and colors that I never had seen before, I started to ask myself: Is my own life worth the pain and strife, is it worth the toil and the blisters, the sweat, the tears? The cats obviously had now gathered around me and while we walked on in darkness and silence — only occasionally broken by a faint meow — I came to the conclusion, that it was worth it, of course it was worth it! One moment of complete harmony, feeling safe, dry, and warm, one moments of elation and utter bliss, one moment of happiness alone would make life worth living. My little friends experienced many such precious moments. I too experienced many of this moments. Together with my little friends, together with my mate, even when I was alone. Even when I was alone! This may sound a bit weird to one or the other reader, but it is easy to explain: When I am meditating and the brain chatter dies down completely and the sensation in my naval areal and along my spine and in my whole body becomes more and more intense I occasionally reach a state of serenity and invincibility that makes all my worrying and grieving look petty and immature. Such events for sure also count to the moments that make life worth living. Every now and then I enjoy the mentioned spiritual moments also while I’m walking with the cats. Today I didn’t have such an experience, I was composed and calm, but nevertheless far away from feeling serene and invincible. The preconditions were not right, the stars where not in the right constellation, it was just not the right time. We made another turn to the left and entered an area with very old and big trees. This is a stripe along the north-west and south-west border of the forest, which is easy to pass and which ultimately leads back to our house. The cats were all there and Cindy’s ghost was also still with us. I know of course that Cindy’s ghost exists only in my head, but that is nearly as good as if she would still be alive. After all, every experience of the outside world exists only in my head and is nothing else than an interpretation of the incoming sensory signals. A vivid imagination and a fairly good memory is all what Cindy’s little ghost needs to ride on. She will be with me till I die. The cats were now very disciplined and we went all the way home without further pauses and delays. Though we were fast approaching home it took nevertheless long enough to let me replay the memory of one of the spiritual moments that I was experiencing during another walk with the cats. It was five years ago and we lived in an old farmhouse surrounded by meadows, fields and hedges. 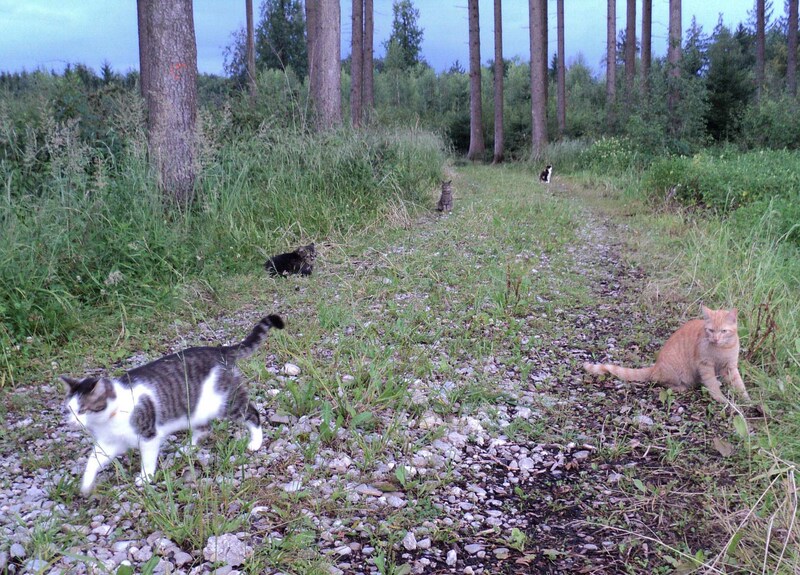 I often went with the cats along a small path between the cornfields and meadows that after some time leads into a narrow passage which ultimately ends at a railroad crossing. Usually we stopped right before the passage and the cats would then explore the surrounding meadows and hedges. After some ten minutes I would call them and when they all had reappeared we would go back to the house. This time though the cats didn’t disperse but set down in a circle. It was not a circle around me, it was a circle including me. The cats sat there quietly and motionless, so I kneeled down too — there was not the slightest sound. It was night but the sky was clear and inky blue. It was not dark, a million stars shone on us. We sat there for approximately twenty minutes and I went through a multitude of feelings and mental states. Just as I was starting to wonder if we would sit there still in the morning, one cat suddenly went up and all the others followed, stretching themselves and looking at me appreciative. I said: “Okay, my friends”, while I went up and I regretted instantly that I had interrupted the sacred silence with my casual and dispensable words, but the cats didn’t seem to mind and we walked quietly home. My cats don’t ponder about the things and notions, which I tried to describe in this blog post, they are practical, emotional, but not overly reflective. They cherish the good times and muddle through the bad times — as we all do. Are cats wise? Not int the sense that I understand wisdom. They accumulate life experience and react more appropriately to new situations and new challenges as they get older. But their horizon is limited, even more than ours is, and they cannot change and readjust their instinctive behaviors as extensively as we can (or some of us can — or some of us could). Cats are fast and can jump high and far, but they cannot jump over their shadow. Cats are great teachers though and they are the most charming ambassadors of nature. I deeply admire them!